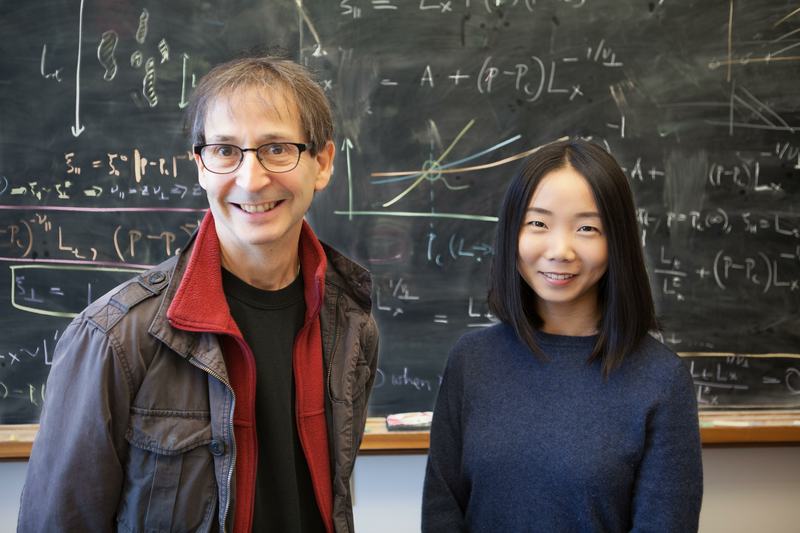 U of I Swanlund Professor of Physics Nigel Goldenfeld (left) works with colleague Chi Xue (right) at the Carl R. Woese Institute for Genomic Biology. Photo credit: University of Illinois at Urbana-Champaign. There is remarkable biodiversity in all but the most extreme ecosystems on Earth. When many species are competing for the same finite resource, a theory called competitive exclusion suggests one species will outperform the others and drive them to extinction, limiting biodiversity. But this isn’t what we observe in nature. Theoretical models of population dynamics have not presented a fully satisfactory explanation for what has come to be known as the diversity paradox. Now researchers at the Carl R. Woese Institute for Genomic Biology at the University of Illinois at Urbana-Champaign have shed new light on this fundamental question in ecology, by improving a popular proposed scenario for diversity known as “Kill the Winner.” Chi Xue and Nigel Goldenfeld, supported by the NASA Astrobiology Institute for Universal Biology, which Goldenfeld directs, approached the diversity paradox from the perspective of non-equilibrium statistical mechanics. Goldenfeld and Xue developed a stochastic model that accounts for multiple factors observed in ecosystems, including competition among species and simultaneous predation on the competing species. Using bacteria and their host-specific viruses as an example, the researchers showed that as the bacteria evolve defenses against the virus, the virus population also evolves to combat the bacteria. This “arms race” leads to a diverse population of both and to boom-bust cycles when a particular species dominates the ecosystem then collapses—the so-called “Kill the Winner” phenomenon. This coevolutionary arms race is sufficient to yield a possible solution to the diversity paradox. These findings were published December 28, 2017, in Physical Review Letters, in the article, “Coevolution Maintains Diversity in the Stochastic ‘Kill the Winner’ Model.” (PRL, 119, 268101, 2017). Goldenfeld and Xue looked at a classic example of the diversity paradox from marine biology, the paradox of the plankton. In observed marine ecosystems, many plankton species and bacterial strains coexist and have high diversity. Goldenfeld explains, “There any many tentative hypotheses to solve the paradox. The one we are interested in is the ‘Kill the Winner’ (KtW) hypothesis. In a nutshell, it says that the problem with the diversity paradox is the assumption of a steady state. A real ecosystem is never in a steady state, but undergoes population fluctuations due to the interplay between predators and prey. To go beyond the simplified model, Xue and Goldenfeld developed a stochastic model of bacteria-virus interactions that could describe population fluctuations, in order to see whether the KtW scenario really emerged from calculations more detailed than those undertaken previously. Their model described the outcome of the bacteria-virus encounters using a method similar to that used in statistical thermodynamics to describe colliding atoms in a gas. Just as one can compute the properties of gases—such as sound waves and thermal effects—from understanding the atomic collisions, Xue and Goldenfeld used statistical mechanics methods to compute the behavior of populations from understanding bacteria-virus encounters. Goldenfeld explained that the KtW scenario was not put into their calculations by hand. Their goal was to model the bacteria-virus interactions at an individual level to see if KtW emerged. However, from their simulations, Xue and Goldenfeld were surprised to find that the species in their model didn’t even co-exist let alone exhibit KtW dynamics—they were driven to extinction! The researchers realized that there is another way in which ecosystems are not in a steady state, separate from the population fluctuations that they had attempted to model. Real ecosystems are also evolving. Indeed, when they also included coevolution into their model, the model recapitulated the biodiversity observed in nature. Goldenfeld says it was satisfying to see how the use of stochastic modeling enabled the team to include the already well-known coevolutionary arms race within a simple model, from which emerged Kill-the-Winner dynamics. Goldenfeld and Xue plan to pursue this line of inquiry further. They speculate that diversity is generally related to how far away an ecosystem is from equilibrium. Future work will attempt to quantify the relationship between diversity and the distance from equilibrium. The researchers’ interest in this problem arose from a seemingly different area of science. Goldenfeld explains that this work has implications for open questions in astrobiology and for detecting life on extraterrestrial worlds. This work was supported by the National Aeronautics and Space Administration Astrobiology Institute (NAI) under Cooperative Agreement No. NNA13AA91A issued through the Science Mission Directorate. C.X. was partially supported by the L.S. Edelheit Family Biological Physics Fellowship from the Department of Physics, University of Illinois at Urbana-Champaign. The conclusions presented are those of the researchers and not necessarily those of the funding agencies. Expert viewpoint: How does sexual harassment affect young women in physics? In a study reported in the journal Physical Review Physics Education Research, nearly 75% of 471 undergraduate women in physics who responded to a survey offered during a professional conference reported having experienced at least one type of sexual harassment – mostly gender harassment – in their field. U. of I. anthropology professor Kathryn Clancy, a co-author of the report, talked to News Bureau life sciences editor Diana Yates about the study, which also examined the respondents’ feelings of belonging and legitimacy as scientists and scholars.